Combining the latest design philosophy with a car acclaimed by both critics and customers, it packs raw performance with Lotus’ latest aerodynamic developments, to provide a first-class replacement for the Evora Sport 410 model. Employing key elements of the GT430’s sculptured body style, including specifically designed new composite front and rear body panels, but without some of the high downforce elements, the new Evora GT410 Sport enjoys a far subtler and sleeker silhouette. However, as with all Lotus sports cars, aerodynamic downforce is a requirement and this new GT class coupe generates up to 96kg of downforce (50% more than the Evora Sport 410) making it the new benchmark when compared to similarly priced rivals. Lotus’ newly defined GT-class sports car captures the essence of the company’s headline model. The application of top-down evolution introduces the new front and rear aesthetic, first seen on the GT430. As a result, the car’s design combines considerable physical presence with natural aerodynamic ability. The revised front panel features two enlarged carbon fibre ducts, with integrated air blades, to efficiently move air around the front wheels reducing turbulence and decreasing drag. Additional downforce is created by the combination of the deep front splitter and new motorsport-derived rear diffuser, mounted beneath the new style metal mesh grille which gives a cleaner finish. Sculptured carbon fibre ducts behind each rear wheel vent high pressure air as quickly as possible from the rear wheel arches, balancing downforce. Cumulatively this all works to boost downforce to 96 kg at 190 mph, a sizable jump of 50% over the outgoing Evora Sport 410, and a massive three times that of the Evora 400 with an improved drag coefficient. This elevates the Evora GT410 Sport to the top ranks of Lotus’ most aerodynamically efficient road cars. As with all high-performance Evoras, carbon fibre plays a considerable role in the car’s construction. Standard carbon composite components include the front access panel, roof panel and a one-piece louvered tailgate with integrated spoiler, as well as the elements within the front air blade system and rear wheel exit ports. This focus on the car’s critical mass delivers its headline power-to-weight ratio of 326 hp / tonne and the top speed to 190 mph (305 km/h). Despite the car’s low mass, a range of lightweight options can be specified for the Evora GT410 Sport. This includes a titanium exhaust, cutting 10 kg from beyond the car’s rear axle. 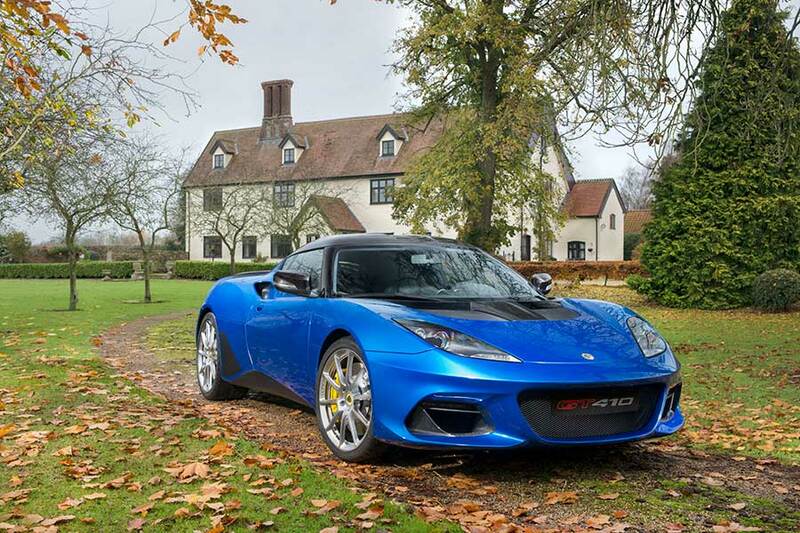 Making the most of the traction on tap, the Evora GT410 Sport uses Michelin Pilot Sport Cup 2 tyres (235/35 R19 at the front and 285/30 R20 at the rear) with a sports suspension package of Eibach ultra-light, low-sideload springs and Bilstein sports dampers – all fitted as standard. A touring suspension package is available as a no cost option, featuring Bilstein® non-adjustable dampers, with touring specification, and Michelin Pilot Sport 4S tyres. For full damper adjustability, a race suspension package using Lotus-tuned lightweight Öhlins TTX aluminium two-way adjustable dampers (twenty click adjustment compression and rebound) which save 13 kg, can be specified to tune the Evora GT410 Sport to precisely suit particular road or track conditions. Reducing un-sprung mass, ultra-lightweight, fully machined, forged aluminium wheels (19″ 8J front and 20″ 9.5J rear 10 spoke alloy wheels) are available in either silver or matt black. The option of upgrading to one inch wider (10.5J) rear wheels as used on the Evora GT430, is available and stopping power comes courtesy of AP Racing four-piston calipers front and rear with lightweight 2- piece cross-drilled and ventilated brake discs (front 370mm x 32mm, rear 350mm x 32mm). transmission utilizes an optimized gearbox ECU for ultra-fast changes. Gear selection is made via lightweight aluminum paddles mounted to the steering wheel. vehicles to their personal taste. 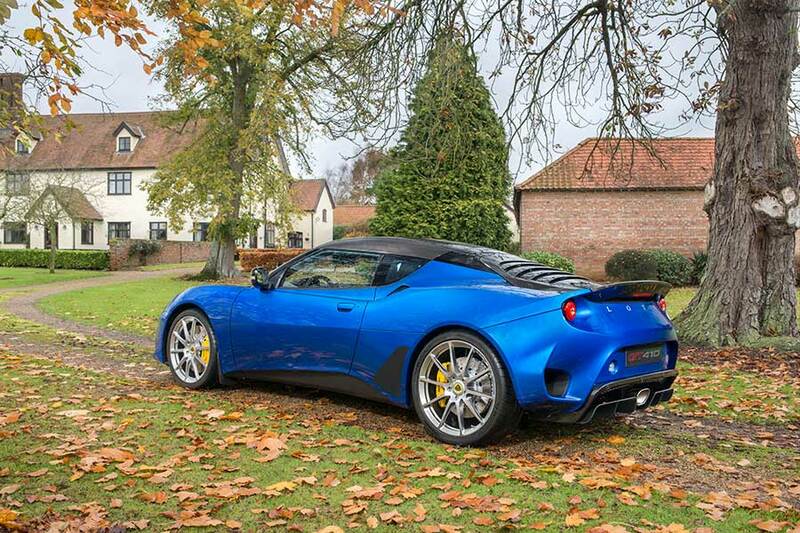 Since its introduction last year, roughly a third of all new Lotus cars now undergo some form of customization.